The NLG and NLG-NYC Chapter are co-convenors of the International Tribunal of Conscience of Peoples in Movement (ITCPM) to take place in New York City, September 25-27, 2015. The Tribunal coincides with the one-year anniversary of the kidnapping and forced disappearance of 43 students in Ayotzinapa. 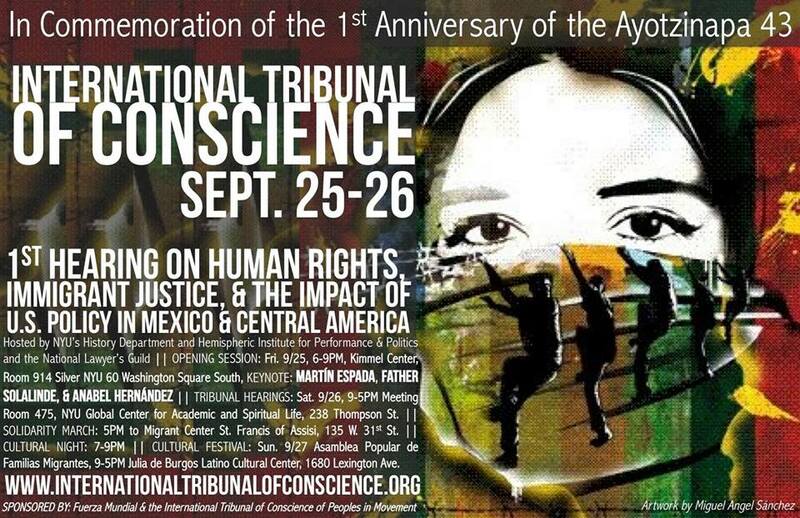 Alleged crimes against humanity committed by the Mexican government and its allies in the U.S. and beyond will be the focus of special hearings held by the International Tribunal of Conscience of Peoples In Movement (ITCPM) in New York City on Friday, Sept. 25 and Saturday, Sept. 26, 2015. The tribunal is in commemoration of the first anniversary of the forced disappearance of 43 students from the Rural Teacher’s College of Ayotzinapa. The current human rights crisis in Mexico is unprecedented in the country’s history in terms of scale, depth, and extent (over 160,000 dead and 27,000 disappeared since 2007, not including a still unknown number of disappeared migrants): Mexico is the single worst violator of human rights in Western Hemisphere and one of the most egregious in the world. The focus of the hearings in New York will be on Mexico’s deepening human rights crisis in all of its relevant dimensions, including the role of U.S. aid (over $3 billion dollars in military, police and other aid directly related to the so-called ¨drug war¨ since 2007 through the ¨Mérida Initiative¨, which many analysts consider analogous to ¨Plan Colombia¨, plus over $4 billion in arms sales) and that of the North American Free Trade Agreement (NAFTA). The event will open Sept. 25 at 6 PM with an evening of speakers, culture and art including representatives of the parents and students of Ayotzinapa and of indigenous victims of human rights violations from Chiapas, renowned Latino poet Martín Espada, father Alejandro Solalinde, exiled Mexican journalist Anabel Hernández, a special performance by jazz percussionist Warren Smith of the Composer’s Workshop Ensemble, and the unveiling of a piece donated by artist Lynda Black, among others (NYU Kimmel Center room 917 Silver, 6 to 9 PM Friday Sept. 25), 60 Washington Square South. The tribunal hearing will be all day Saturday Sept. 26 from 9 to 5 Pm at Meeting Room 475, Global Center for Academic and Spiritual Life, 238 Thompson St., Manhattan (NYU). Events will include a cultural event Saturday night from 7 to 9 PM at the Migrant Center of St. Francis of Assisi Church (135 W. 31st Street, Manhattan), and an all-day cultural festival Sunday Sept. 27 from 9 AM to 5 PM at the Julia de Burgos Cultural Center at 1680 Lexington Ave. (between 105th and 106th Streets, Manhattan), cosponsored by the Popular Assembly of Migrant Families (APOFAM). Conveners include Mexico’s national network of human rights defenders plus internationally renowned intellectuals and human rights scholars such as Noam Chomsky, Tariq Ali, Boaventura Sousa de Santos, Greg Grandin of the History Department and the Hemispheric Institute of Performance and Politics at New York University (NYU, who are hosting the event with the National Lawyers Guild and its NYC Chapter), and former UN Special Rapporteurs Rodolfo Stavenhagen and Jorge Bustamante. Jurors will include participants from the U.S., Mexico, Latin America, Europe, and Asia. The initiative to convene the Tribunal grew out of the caravan in the U.S. in March and April 2015, and subsequently in Europe, of representatives of parents and students from Ayotzinapa in the Mexican region of Guerrero. 43 students from the Rural Teacher´s College there, mostly from the country’s poorest indigenous communities, were victims of the single worst incident of forced disappearances in recent Latin American history in September 2014. This special session of the ITCPM is timed to coincide with the first anniversary of the Ayotzinapa disappearances and with this year’s opening session of the UN General Assembly, and will be dedicated to solidarity with the Ayotzinapa case. From the perspective of the conveners of the Tribunal, the events in Ayotzinapa are illustrative, not exceptional: the Mexican government typically seeks to position itself as a victim of drug-related violence, but like its Colombian counterpart, is in fact the perpetrator of, or complicit in, most serious violations of human rights. Another key priority of these hearings will be an examination of persistent serious human rights violations against immigrants of Mexican origin in the U.S., and against migrants in transit from Central America and beyond on Mexican territory, including the implications and impact of a continuing exodus of migrant children and youth. The Tribunal’s mandate includes exploration of the relationship between the current human rights crisis in Mexico and that in the U.S. concerning police violence, mass incarceration, and racial injustice, including how these two crises converge within the context of issues as to immigrant rights in the U.S. (abuse of deadly force by ICE, Border Patrol, local and state police; detention policies and practices, profiling, deportations, separation of families, impact on children and youth, e.g., “Dreamers”). A key aspect of the Tribunal’s mandate is to explore the relationship between the impact of U.S. policy in Mexico and the impact of related U.S. policies (free trade, “War on Drugs”, and other forms of intervention) throughout Latin America, including key cases such as Central America, Haiti, Puerto Rico, Venezuela, and Colombia. It is U.S. support which keeps the current Mexican regime afloat, and the single most decisive factor in in sustaining corruption, violence and repression against the Mexican population with impunity. The impact of such aid and of foreign investment on intensifying human rights violations has been intensively debated by the European Parliament as well. Additional conveners include: the International Association of People´s Lawyers (IAPL and its Mexican branch), the International Association of Democratic Lawyers (IADL), the American Association of Jurists (AAJ), the Haldane Society of Socialist Lawyers of the United Kingdom, IBON International, the International Coalition for Human Rights in the Philippines, and the network of U.S-Mexico activists known as Fuerza Mundial Global.